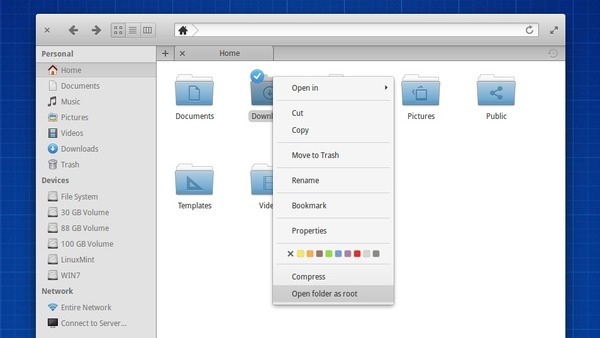 This is a step by step tutorial shows how to add “open as root (or administrator)” option in Pantheon file browser in Elementary OS 0.3 Freya. Elementary OS 0.3 Freya is lightweight and beautiful Linux distribution based on Ubuntu 14.04 LTS. Its default Pantheon file browser now has ‘Open in terminal’ option in folders’ context menu out-of-the-box. But if you want to open a file or folder as root permission in Pantheon, you have to do a little tweak on your system. 1. Open Software Center, search for and install gksu, a graphical frontend to su. It’s useful to graphical programs that need to ask a use’s password to run program as another user. 2. Open terminal from the Application menu. The code before ‘&&’ will create a empty file ‘folder-openasroot.contract’ under /usr/share/contractor directory, and the code after will open the file with the Scratch text editor. When the file opens, paste below context and close the file (It’ll be saved automatically). Now re-open your file browser and you’ll see the “Open folder as root” in folders’ context menu. When the file opens, paste below and close it. Thank you so much I have been searching for this since Luna. I change scratch-text-editor by gedit, How would the code in this new scenario ? thanks! Replace the scratch-text-editor with gedit and skip the part before &&(include &&) since it automatically created non-exist file, and the new created files will be opened with Gedit text editor, and don’t forget to click Save button after editing. [_LOG_LEVEL_FATAL 12:01:24.624975] Scratch will not function properly. [_LOG_LEVEL_FATAL 12:01:24.791536] Scratch will not function properly. [_LOG_LEVEL_FATAL 12:01:24.791808] Scratch will not function properly. [_LOG_LEVEL_FATAL 12:01:24.792371] Scratch will not function properly. [_LOG_LEVEL_FATAL 12:02:07.707355] Scratch will not function properly. [_LOG_LEVEL_FATAL 12:03:20.734125] Scratch will not function properly. [_LOG_LEVEL_FATAL 12:03:20.840288] Scratch will not function properly. [_LOG_LEVEL_DEBUG 12:03:20.854908] MainWindow.vala:476: ‘unsaved’ directory already exists. [_LOG_LEVEL_FATAL 12:03:44.499832] Scratch will not function properly. Could you please help me resolving it? Thanks for your reply, unfortunately it doesn’t work – there is no “open in terminal” option after right-clicking on a file or folder. hello, thanks for the tweak but after following the steps twice wheni right click on a folder there is no “open as root ” or similar option. does anyone know why this may be? You may go to the File browser -> Computer/System -> usr -> share -> contractor, and check out the new created files (and their content) are really there. When file opens, paste the rules and finally click SAVE. Log out and back in. Awesome, this was what i was looking for. I recently also had to run blender as root to get the CUDA support to work so I added this in as well. As always use it at your own risk when running executables as root, but it is handy. I used gedit instead and it worked great for me as long as the file is a text file. I would also like to open other file types that gedit will open like .desktop files. I tried to change the MineType to include desktop but it failed. Can you give me some guidance? In fact the method works only if you choose either one option (having open folder as root or file) When you make both none is available after restart or log out. Ben, after you paste the code to scratch, hit the space bar before closing the file, else it won’t save it and it will not work for you. I accidentally dumped the code for the open-as-root file into a terminal and the line “Exec=gksudo pantheon-files %U” seems to have done something. Now when I open Files, it always opens into the folder /%U. Do you have any idea how I fix this?